More than 100,000 investors want to invest in your startup. 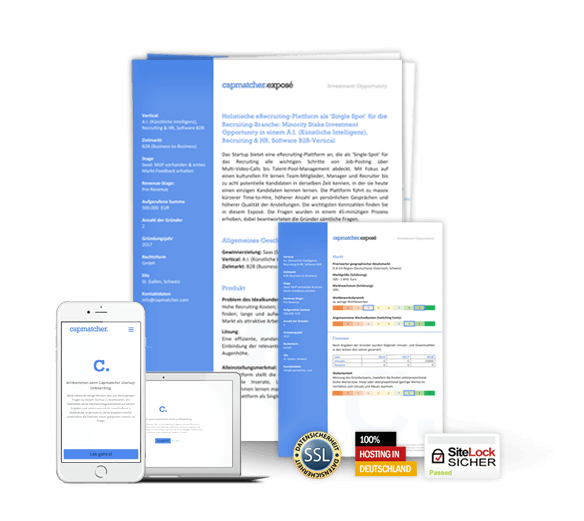 Secure highly relevant investor contacts who are looking specifically for your startup by registering your startup information with capmatcher. Upload your start up profile now. Free of charge. Over 100,000 investors are waiting for you. Focus on your startup – and let us find the right investors for you. All you have to do: apply by filling out our capmatcher form. No more scrambling. The capmatcher-questionnaire guides you step by step through the most important questions regarding a financing round. Over 100,000 investors in the United Kingdom and the USA. We will introduce your startup to prospective investors who are exactly looking for startups with your criteria. We will create your free capmatcher.exposé of your startup for you. Use it as an introduction with investors or as a sparring partner before your next pitch. Have you thought about all the verticals and chosen the right startup phase? A capmatcher employee will personally take care of your details. 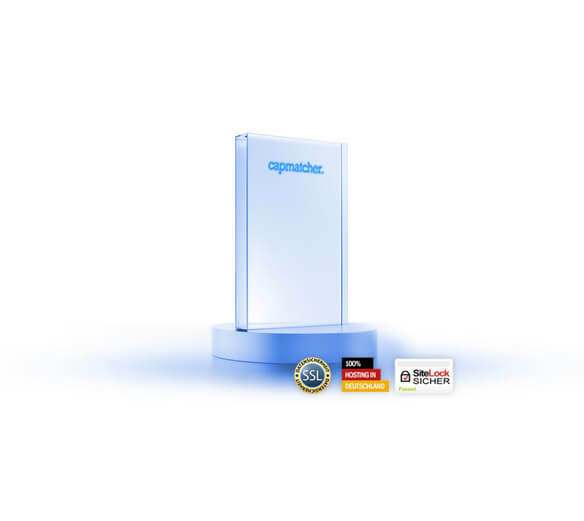 Capmatcher is independent, transparent and secure. Your data will be transmitted to us exclusively via an encrypted network connection. Our questionnaire and the capmatcher.exposé have been put through their paces many times. Investors appreciate the depth and quality of the questions. We maintain more than 60,000 concrete data records for investors in United Kingdom and the USA who are actively looking for new investments. This depth of data allows us to find the right investor for every startup. 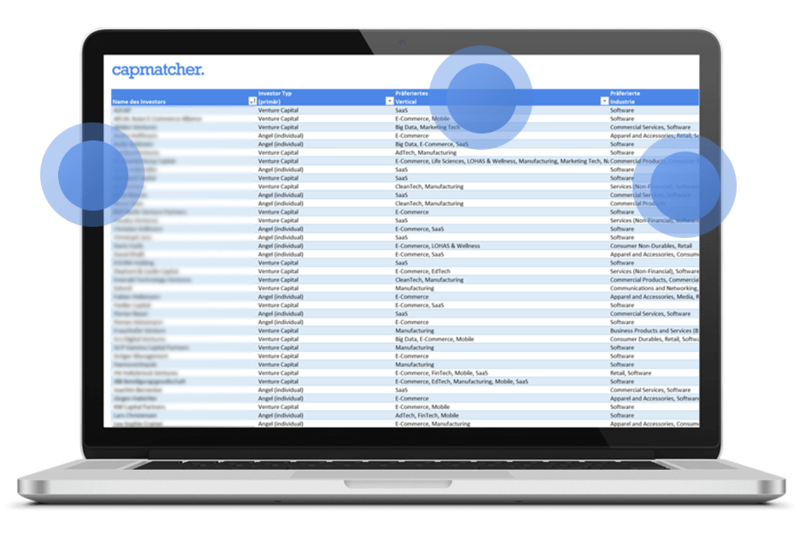 No matter if business angel investors, angel groups or venture capital: Capmatcher does not only provide you with names but classifies them according to investor type. This significantly increases the chances of finding a financing round. The distinction between preferred vertical and preferred industry on the part of the investor is your biggest lever in the successful search for an investor. Make use of it! The better and higher the quality of your data, the greater the chances of finding a suitable investor. That’s why we need a complete capmatcher questionnaire from you. Just take some time to complete the capmatcher form. We only ask for the data about your start up that is really required by investors for a first decision. You have to go through this process only once. All data entered? A member of our team reviews and edits your data for a final polish and creates your exposé. You will usually receive it within 24 hours by e-mail and are then free to use it. Afterwards we will occasionally introduce you to suitable investors who are looking for special startups in your stage, your industry, your vertical and other criteria. If an investor has serious interest, we will get them in touch with you. Free of charge. Do you want to give 110%? Secure a list of 50+ active investors looking for your startup characteristics. We have access to over 100,000 investors, so we can find a tailor-made contact for your financing round. Let’s go! Take 20 minutes to choose your option and complete the startup form.